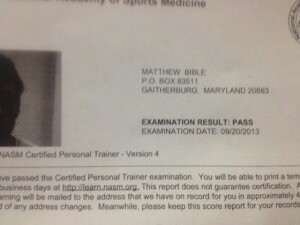 MATTBIBLE.COM » I am now officially certified as a personal trainer! I am now officially certified as a personal trainer! Tysons Corner, VA . After three heart pumping minutes between answering the last question and finding out my results, I saw the computer screen in the front office of the proctoring classroom say the word “pass” next to my exam result. I didn’t say anything until the proctor made it official. The exam was not a walk in the park at all. You do have to be pretty in depth with your studies since many of the questions were comprehension of the material you learned. I am so relieved that part is finally over. Now, I can go back to having some sort of freedom again! I have some big plans in the next few weeks. I am getting everything together, and I cannot wait to start training my first client. Learning, however, will never stop. I strive to be one of the best in the industry, so it’s going to take a lot of knowledge and dedication. I will also regularly make posts on here with my new fitness section. Some posts will be helpful hints and strategies anyone can use. Some posts will be feel good stories of my clients or people I know in general. Other posts will dig from my own personal experience. I’m ready for this new journey, and I couldn’t be happier. Let’s help make the world healthier and fight this obesity epidemic.